The first thing I thought when I saw this new version, was “Hey, I know that thing”. And indeed, the casing of this new handheld is identical to the TYT TF-F8. The difference: the TYT versions are single band, the UV-5R is dual band. Yet the price doesn’t reflect this; the UV-5R is about as expensive as a single band TYT. The current price hovers around the $55 mark. When compared to the now (in)famous UV-3R and its varieties, there are some big differences to report. Power output is one of them – 5 Watts on VHF, about 4 Watts on UHF. The battery pack is rated 1800 mAH, and a decent desktop charger is part of the package. The UV-5R also supports DTMF. All of this promises the UV-5R to become the cheapest full-featured dual band ever. Some questions remain, and answers will have to wait until I have finished testing mine. Harmonic suppression is one of them, and I’m also curious whether the receiver will be able to cope with the insane amounts of out-of-band signals I’m dealing with here. We’ll keep you posted, and a proper review will follow as soon as possible. Hello, I got my UV-5R last week and its a nice unit ,but I give up trying to program the memory’s! and ordered a USB cable, also I think the ant is junk as far as I can tell, the FM band is very weak with it. I have an NAGOYA 666 on my UV-3R and that works great on all bands. Now I just have to wait till next month for the new Nagoya ant and USB cable for the UV-5R to arrive! I have VirtualBox installed on my Linux Mint 11 computer and Windows XP running in that to program both radios! it works perfect with the UV-3R and hope the UV-5R programs as good,the software installed easily. PS: they now have a new UV-3R “Plus” out and it’s completely different from the original and the Mark II models. It uses the same programming cable as the UV-5R !! the last post on my blog might be of some help. anyone know how too make it only show one display my shows a dual display and i dont want it too show a dual display is there any way too turn off dual display ? Not that I’m aware of at this point. The dual band display is considered to be a feature. You can set display B to ‘name’ and choose a blank name ‘ ‘ for that channel. Names can only be set in software. Pressing the ‘Band’ key while pressing PTT will do the trick. Thank you! i keep pressing them one after another, did not read the manual right! they must be press together! A friend brought me his new UV-5R to program for him and testing it on a local 146.64 (club) repeater I didn’t realize it was transmitting a dual after-tone when I released the key. An older HAM listening gave me a very prompt scolding reinforcing the reason why so many HAMs have left their club over the past 15 years. I told him I didn’t know it was and didn’t have a clue how to fix it. He reminded me that it was unacceptable and basically told me to get off the repeater. I cleared the repeater and was doing just that when another younger more friendly HAM came on and said he knew what kind of radio I was working on and said the only way to clear those tones was with a full CPU reset of radio. The manual doesn’t tell how to do that and so far I’ve spent hours searching the Internet trying to find some way to resolve the problem without success. I find it difficult to believe that with old school HAMs making such a fuss about this there isn’t anything I can find on the Internet about this problem with this radio. I thought I would get one myself but I’ve changed my mind. I don’t like being scolded every time I key up. Is there an easy way to turn off the ending transmit dual tones? They are annoying and I won’t be testing it again until I find a way to do this. It looks like the ‘Roger Beep’ is turned on. Press Menu, 39, and Menu again. Set this option to ‘Off’ by using the up/down buttons. Press Menu again to save your choice. If necessary check menu 19 (PTT-ID) and set this to ‘Off’ also. I had no idea what it was called and had been through the menu but never saw that before. Thank you so much, this seems to have resolved my problem. 🙂 Perhaps this will be a good day. I was NOT able to disable the PTT-ID tones using menu selection 19 in channel-mode. I could set PTT-ID to “OFF” and then save the value (press MENU), but when I went back and looked it was back at BOT. This is with the UV-5R+ FW ver 293. Only a RESET-ALL was able to clear this. I hope this is a quirk. Glad to see that Byron had better luck. 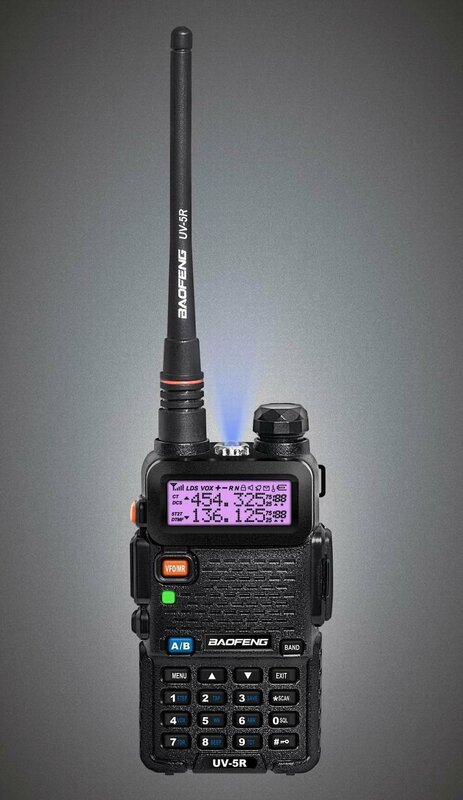 does anyone knows if it is possible to program on BAOFENG UV-5R a channel with a shift repeater of 10 MHz? I want to use this radio on 400 MHz band at work and i need this shift. In the past i had some radios that needed some internal modification to work with this shift value. Does anyone know more details about “Channel name” programming feature on this radio? So far I discovered that Baofeng software does not allow more than 6 Characters, although radio haves 7 available characters on display itself. Also Chirp software accepts 7 characters. I didn’t try since I don’t have USB cable yet, but would like to know anybody’s experience. Starting from CHIRP Daily 20120723, you can enter 7-character tags. It works. Do not enter lower case characters though – the UV-5R display doesn’t support them. I haven’t found a way to do this from the radio directly. Neither a way to continue scanning when a signal is received. can someone explain the TO, CO, and SE scanning modes? to, co, se are scanning modes. is u press the scan and hold for >2secs it goes into scan mode and starts scanning. to: will stop at an active signal for a given time and continue to scan and stop cycle. co: will stop at an active signal until the carrier is off of the signal, only then it will continue. se: will stop at an active signal and THATS IT. it has finished it work. hope u understand the difference. only thing i cant figure out is how to scan from one fqy say a to fqy b only. It not totally clear from the manual. There is an “emergency”, setting, but it’s purpose isn’t clear. Thanks! That option doesn’t exist, as far as I know. Can someone offer a difference factor, in the BFBxxx (Hold 3 key and power up) builds, in relation to better functions on the radio? Seems they’re up to BFB291 now, which had some issues with PC programming, but has since been resolved. I’d like to see squelch and VOX working, although the transceiver works fine out of the box. What does the envelope icon on the UV-5R stand for, or what does it do? Hi is any one got any problems with bfb293 I have been trying for three days without any luck to programe with pc????? I’m having an issue with m UV-5RA where I cannot hear any Rx transmissions unless I hold the monitor key. This includes NOAA frequencies. Does anyone have a clue on how to fix this? It didn’t start doing this until I started using CHIRP with it, but since then I’ve used the “RESET-ALL” function within the menu of the HT without luck. HELP! Thanks. Apparently an issue with Chirp; your problem sounds as if there’s a CTCSS/DCS code programmed into the radio. 1. Do a manual check on CTCSS / DCS menus to find out if there’s anything programmed in there. the envelop icon is part of the generic LCD unit and has no function on the UV-5R. Some digital radios are using it now; the icon will alert you when there are text messages waiting. At the other side of the spectrum there are cheap radios which have the same display unit, but use even less icons than the UV-5R. I have learned that some new radios are using the same hardware as the UV-5R. The radios are capable of decoding 2/5 tone like fire pager tones. Would it be possible do you think to flash the firmware of the 5R to do the same? Only if the manufacturer chooses to do that in new models. UV-5R firmware can’t be changed / updated afterwards. So, can these be used as fire pager tones? Can it be programmed to tone like a pager? i have a uv5r+. im trying to use it along with camp radios on 151.955. i can ere them but no one can hear me. what do i need to change? These camp radios use a CTCSS tone, also known as PL tone. You need to match both radios to use the same tone. I do not have any “BAND” button on my unit, so this is giving me problems to transmit 1750 tone, does anyone have any ideas on how I can do this? Well, it helps to specify what model you have. I have a UV-82 which also does not have a band button, however I can transmit the burst tone with the “F” button on the side. Just hold the PTT button and try hitting all other buttons. I’m sure you’ll be able to find it.